It's getting to be that time (in CT) where night time temps are below freezing. If your track bike runs straight water...now is the time to drain it out and replace with antifreeze. 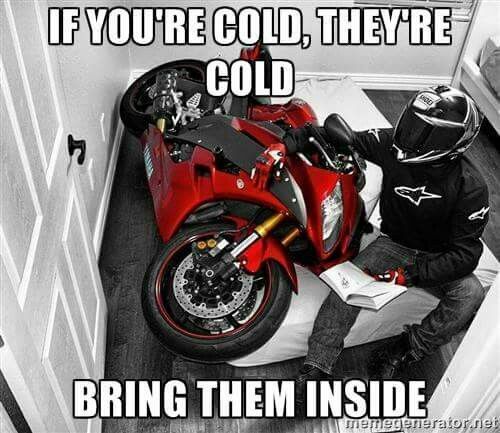 Another good reminder for those who store their bikes indoors or in a basement - drain the tank. I don't know what's more shocking. That that guy's garage blew up and I totally forgot that thread...or that it was SEVEN years ago. Or the fact born is ten years old in a few days. I keep the tank full and leave it in the garage or shed. Much less likely to rust that way. Somebody come remove my crashed bike from the trailer, and then remove the water from said crashed bike. Expert opinions needed on cold track tire choice.